Faerie Lore : "Yallery Brown"
I have always been attracted by this singular fairy character. 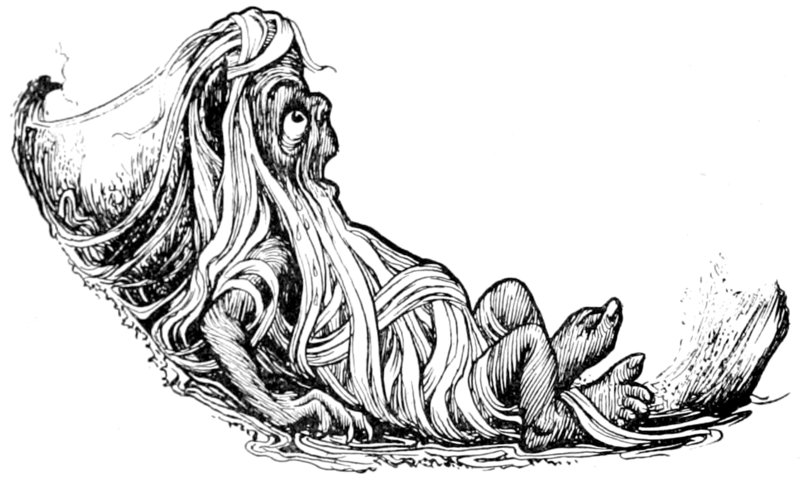 “Yallery Brown” is a mischievous fairy-like nature spirit in an old Lincolnshire folk tale from England, which itself is usually named after the creature. You may always find him supposedly trapped or sleeping under a flat stone…so, watch out! >Suggested Albums for folk band versions of "Thomas the Rhymer" and "Tam Lin"
> FairyLore concerning the Otherworld have always nurtured the folk music ballads, and the characters of Tam Lin and Thomas Rhymer are not excluded. 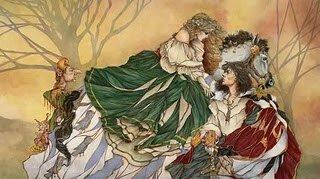 In the case of Tam Lin I gladly recommend versions from Fairport Convention‘s “Liege and Lief“, featuring the vocals of Sandy Denny w/ arrangement of “Tam Lin” by Dave Swarbrick, and from Steeleye Span’s “Tonight’s the Night,” featuring a rocking version by Maddy Prior. Regarding “Thomas The Rhymer” I recomend once again the work of Steeleye Span – they have recorded two different versions for the “Now We Are Six album“, and Re-recorded (differently) for “Present–The Very Best of Steeleye Span” album. 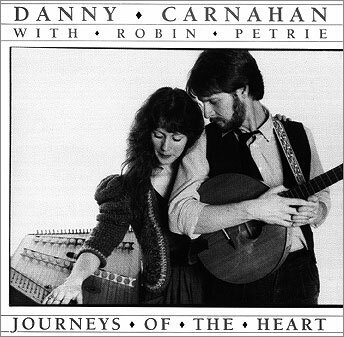 There is a cute rendering of this ballad under the name of “True Thomas” by my friend Danny Carnahan on his solo album w/Robin Petrie “Journeys of the Heart“. Now it’s time you were away. >Faerie Lore : Fairy Music : The Ballad of "Thomas The Rhymer"
Thomas Learmonth (c. 1220 – c. 1298; also spelled Learmount, Learmont, or Learmounth), better known as Thomas the Rhymer or True Thomas, was a 13th century Scottish laird and reputed prophet from Earlston (then called “Erceldoune”) , seems to be the protagonist of the ballad “Thomas the Rhymer” (Child Ballad 37 A/B/C). His reputation for supernatural powers for a time rivalled that of Merlin. Thomas became known as “True Thomas” because he could not tell a lie. Popular lore recounts how he prophesied many great events in Scottish history, including the death of Alexander III of Scotland. Thomas’ gift of prophecy is linked to his poetic ability, although it is not clear if the name Rhymer was his actual surname or merely a soubriquet. He is often cited as the author of the English Sir Tristrem, a version of the Tristram legend, and some lines in Robert Mannyng‘s Chronicle may be the source of this association. 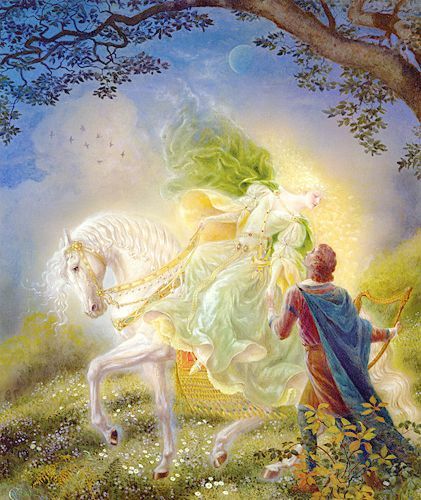 He is also the probable source of the legend of Tam Lin (also called Tamlane, Tamlin, Tomlin, Tam Lien, Tam-a-Line, or Tam Lane), since this character was also raptured by the Queen of the Fairies. While this ballad is specific to Scotland, the motif of capturing a person by holding him through all forms of transformation is found throughout Europe in folktales. 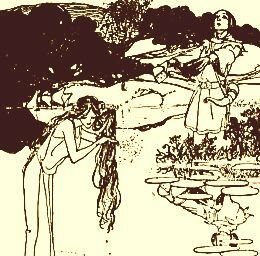 Child took the threat to take out Tam Lin’s eyes as a common folk precaution against mortals who could see fairies, in the tales of fairy ointment. Joseph Jacobs interpreted it as rather a reversal of the usual practice; the Queen of Faerie would have kept him from seeing the human woman who rescued him. Several different variants of the ballad of Thomas Rhymer exist, most having the same basic theme. They tell how Thomas either kissed or slept with the Queen of Elfland and either rode with her or was otherwise transported to Fairyland. One version relates that she changed into a hag immediately after sleeping with him, as some sort of a punishment to him, but returned to her originally beautiful state when they neared her castle, where her husband lived. Thomas stayed at a party in the castle until she told him to return with her, coming back into the mortal realm only to realise that seven years had passed. He asked for a token to remember the Queen by; she offered him the choice of becoming a harper or a prophet, and he chose the latter. After a number of years of prophecy, Thomas bade farewell to his homeland and presumably returned to Fairyland, whence he has not yet returned. Coming riding down by the Eildon tree. Comd out a hunting, as ye may see. And he’s wooden the water up to the knee. For the lack o food he was like to tyne. Beggared man and woman in your countrie. And I will tell ye farlies three. That leadeth down by yon skerry fell? For it leadeth him straight to the gates o hell. That leadeth down by yon lillie lea? But he answered none but that fair ladie. Hang fifty siller bells and nine. And I will shew you ferlies three. Rins thro the springs o that countrie. 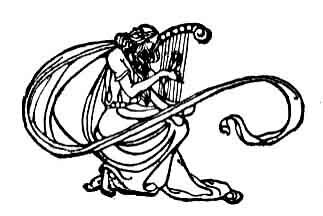 >Faerie Lore : Fairy Music : "Thomas the Rhymer & The Two Fiddlers"
Thomas Learmonth (c. 1220 – c. 1298; also spelled Learmount, Learmont, or Learmounth), better known as Thomas the Rhymer or True Thomas, was a 13th century Scottish laird and reputed prophet from Earlston (then called “Erceldoune”). He is also the protagonist of the ballad “Thomas the Rhymer” (Child Ballad number 37). 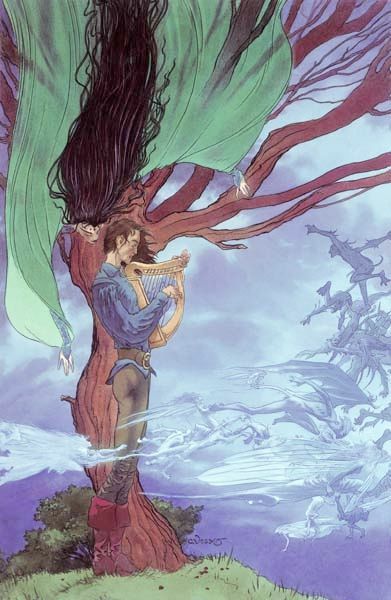 He is also the probable source of the legend of Tam Lin. >Faerie Lore : Fairy Music : "The Story of Thomas the Rhymer"
down her back, is bound round about with a snood that glints with star-like gems, and there is one great flashing jewel above her brow. On each lock of her horse’s mane hang sweet-toned silver bells that tinkle merrily as she rides on. darkness they heard the deep voice of the roaring sea.